Provide the language constant with a name here. This name will be used later to address the constant in each scope. The name has to be unique. Only use capital letters and avoid using special characters and spaces. The name must start with a letter, followed by letters, numbers or _. Avoid this setting as much as possible. This type should only be selected if the language constant appears in both of the cases named above. In Groovy, multilingual text constants can be used to generate log entries or constructions, that, for example, are written back to data fields. The constants can also be implemented for the purpose of labelling when generating data exports via Groovy (e.g. XML files). The object "g_i18n" is available for this purpose, it is initialized with the context language. If the context is missing, the default portal language is used as the fallback. 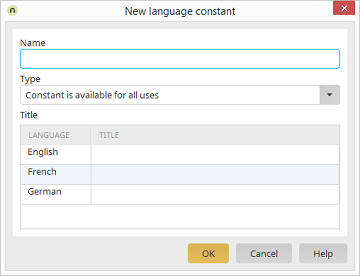 You can give the language constant a title for each of your different portal languages. The portal languages are shown here. The title corresponds to the value that the constant has - it will be displayed when the constant is used in the selected area. Enter the value of your choice here.